Many beautiful meteor showers light up our skies throughout the year. 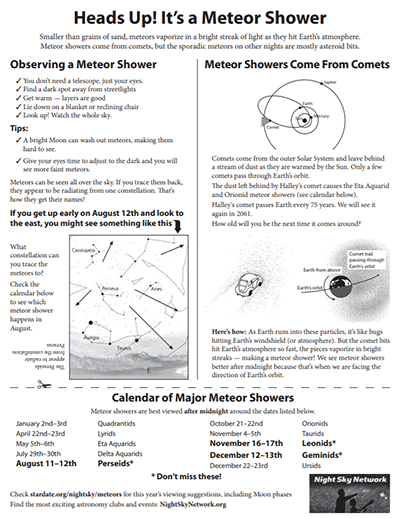 You can share the wonders of meteor showers with this handout! This sheet gives visitors tips for observing, illustrates where meteors come from, and lists the approximate dates for the major annual meteor showers. Club members can customize this handout and add club events or information to the back so visitors know where to find your club and come back for more stargazing and astronomy events.